Successfully Added 5-in-1 USB-C Hub - 3x USB 3.0, 1x USB-C, 1x HDMI, 4K Media Transfer Support, Ultra-Fast, Supports MAC And Windows OS to your Shopping Cart. If you are encountering difficulties in pairing your newly bought USB-C devices with other electronics, this 5-in-1 USB-C hub is perfect for you. With its high-speed transmission speeds and different outputs, this USC-C hub provides you with a convenient way to use your laptop or Mac Book with other electronic accessories. It supports both MAC and Windows operating systems, meaning that you’ll be able to use it with all laptops out there. Simply plug in your hub, connect it to the accessory of your liking, and you’ll be ready to go. 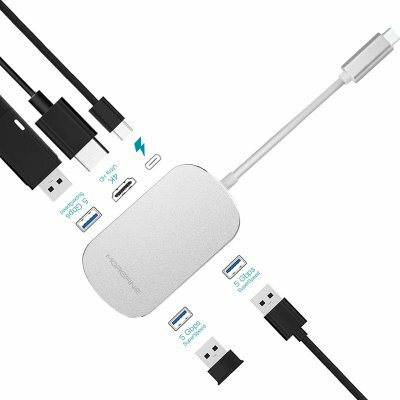 This 5-in-1 USB-C hub features three USB 3.0 ports, one USC-C port, and an HDMI port. The latter supports 4K media transfers. Thanks to this, you can use this cool PC accessory to transfer the latest Ultra-HD media in between your laptop and big screen TV. Additionally, this HDMI port comes in handy for when you wish to pair your laptop to a larger display while giving presentations to a larger audience. Thanks to its ultra-fast transfer speeds, you won’t have to worry about encountering any lag or delay when using this PC gadget. With its durable and compact design, this USB-C hub can be carried along easily anywhere you go. Thanks to the fact that it is capable to work even while it’s charging, you can take advantage of this USB-C hub at any time. It supports different display modes including regular and split-screen. From now on, you’ll no longer have to worry about transferring data in between your USB 3.0 and USB-C deices. With this multi-functional PC accessory in your pocket, you are able to pair virtually any gadget out there with your newly bought laptop. This USB-C Hub comes with a 12 months warranty, brought to you by the leader in electronic devices as well as wholesale PC Accessories..